Manchester United goalkeeper Anders Lindegaard has joined Wayne Rooney in backing Ryan Giggs to be the next permanent manager. Rooney spoke in favour of Giggs following Saturday's 4-0 win over Norwich, but Louis van Gaal remains favourite to succeed David Moyes. Lindegaard has compared Giggs to Bayern Munich boss Pep Guardiola. "It might sound pretty rash and naive, but, in my opinion, we are dealing with a new Guardiola," he wrote in a blog. "What we have seen in the first week has been more than convincing. "The similarities with Sir Alex Ferguson are striking and it is evident that Ryan Giggs has learnt from one of history's most respected football managers." 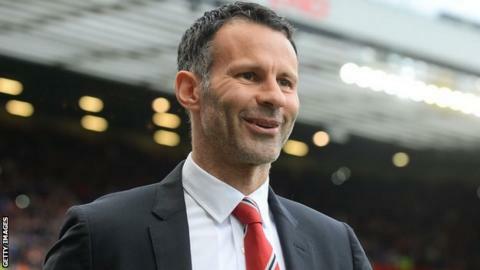 Player-coach Giggs, 40, took temporary charge following the sacking of Moyes last Tuesday. Giggs refused to be drawn on his long-term hopes for the role after the Norwich victory, instead saying his "focus is on Sunderland", United's next opponents. "Some would question whether you can go from being a team-mate one day to a manager the next," added Lindegaard in a column for the Danish Betfair website. "Normally I would have reservations as well, but, in the case of Giggs, it is different. "His latest speech, before the team went onto the pitch for the Norwich game, made my hairs stand on end in a way that I have only ever experienced from Sir Alex Ferguson: Do not disappoint the fans!" A source close to the United squad told BBC Sport: "This is no criticism of David Moyes, but it feels like Manchester United again rather than someone else's club." For now, though, Van Gaal, who will leave his current position at the end of the World Cup, seems most likely to take charge. United insisted at the weekend that no deal with the 62-year-old Netherlands boss, who has also managed Ajax, Barcelona and Bayern Munich, had been signed. However, BBC Sport has learned that the Dutchman held talks with United officials in Portugal last week and that his big ambition is to manage a club in the Premier League. Those discussions are ongoing. Carlo Ancelotti is also thought to be a contender for the United job. However, the Real Madrid manager insisted prior to his side's Champions League semi-final on Tuesday: "I haven't had contact with Manchester United. I want to stay at Real Madrid for a long time."